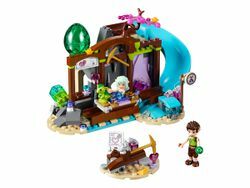 41177 Precious Crystal Mine is an Elves set released in 2016. Explore the beautiful mine and discover its hidden surprises! Join Naida and Farran as they travel through Elvendale and make an exciting find! Help them protect the newly-hatched baby earth dragon Floria and meet the mouse jeweler who makes beautiful jewels from the crystals in the mine. Ride the mine cart with Naida and Floria into the mine and find the hidden map. Stop at the shop and buy a sparkly jewel before heading on your way! Includes Naida and Farran mini-dolls, plus Floria the baby earth dragon and a mouse. Features a 2-level building with water slide, mine cart that seats a mini-doll and baby dragon figure, hidden treasure function at the end of the track, small cave at the back with a bed for the mouse and a second hidden compartment. Includes a mining function with blueprint and heart diamond elements. Slide the lid to reveal a second secret compartment with a ‘diamond' inside. Set the mouse on thelever to move the pickaxe up and down and “mine” the heart diamond. Accessory elements include diamond bricks, a cherry, bed, cheese bricks, cookie brick and a baby dragon egg. Crystal Mine measures over 4” (12cm) high, 4” (12cm) wide and 6” (17cm) deep. Facts about "41177 Precious Crystal Mine"
This page was last edited on 9 February 2019, at 18:06.